When he was younger, Brian Goerke was the envy of the kids in his neighborhood because his father Donald invented SpaghettiOs, a dish which has been a staple in children's diets for decades. For his efforts, Donald Goerke earned the nickname the "Daddy-O of SpaghettiOs. "%%DynaPub-Enhancement class="enhancement contentType-HTML Content fragmentId-1 payloadId-61603 alignment-right size-small"%% More than 150 million cans of the pre-cooked circular pasta are sold annually thanks to Goerke, who died Sunday at his home in Delran, N.J., at the age of 83. As an executive with Campbell Soup Co.'s (CPB) Franco-American division in the early 1960s, Goerke was tasked with developing a pasta product that would appeal to children. It also had to withstand the canning process and be reheatable, a tall order. "We looked at hundreds of different possibilities and decided that spaghetti shaped like circles would be a hit," he told the Burlington County (N.J.) Times after he retired from the Camden, N.J.-based company. Sales took off thanks in part to the unforgettable advertising tagline, "Uh-oh, SpaghettiOs." Mothers loved it because it was easy to serve and didn't create a mess. The rest is history, but Goerke was never one to boast about his accomplishments, according to his son. Co-workers say he was known for his eagerness to assist colleagues in their careers. "He seemed to be a guy who could relate to everybody, treated everybody well," Brian Goerke tells DailyFinance. "I don't remember him ever raising his voice." Ever the loyal company man, Donald Goerke came out of retirement to promote SpaghettiOs on its 30th anniversary, appearing on The Today Show among other places. He hobnobbed with celebrities including President Ronald Reagan, Martha Stewart and Lassie (Campbell sponsored the show), and even appeared on What's My Line? Occasionally, he would autograph a can of SpaghettiOs, one of about 100 products he helped launch during his 35-year career at Campbell. 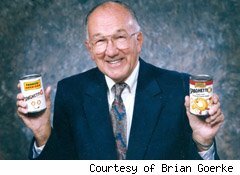 After launching SpaghettiOs, Goerke helped develop Campbell's Chunky Soup, a big seller that did not quite achieve the iconic status of his best-known creation.